This steakhouse was our favorite meal in Rapid City. Not an inexpensive meal, but one where you leave stuffed and happy. Sit in big leather chairs with wheels (I had to yell at the kids to quit rolling around), and dig into their big, flavorful steaks. I was scraping up every last bit of my bleu cheese mashed potatoes. Others in our group liked the house specialties, including the buffalo ribs and the Three Sisters Soup, a Lakota Indian recipe made with beans, squash and corn. For dessert, Grandma shared the warm apple crisp with my daughter and they oohed and aahed about how good it was for the rest of the night. Most people prefer to cook over a campfire while in Custer State Park. 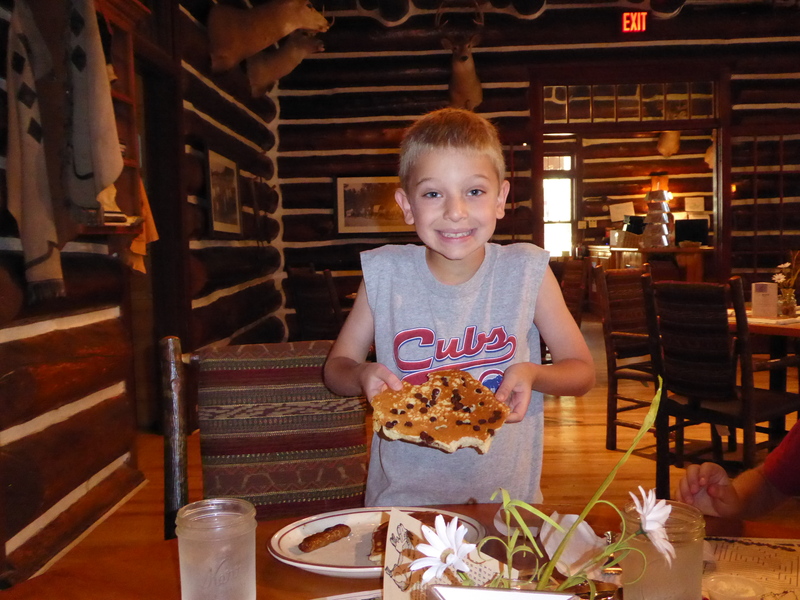 But if you opt to eat at the lodges instead, you’ll find surprisingly good food. The State Game Lodge had a solid selection of salads and sandwiches, such as a tasty portobello mushroom and red pepper sandwich, served on a ciabatta roll. 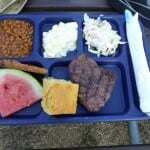 You take a hayride to dinner at the chuckwagon dinner in Custer State Park. A fun-but-cheeky dinner experience is the Blue Bell Lodge’s Chuckwagon Hayride & Cookout., one of several cookout dinner options offered in the park. After everyone’s issued a cowboy hat and red bandana, you take a 45-minute hayride to the dinner site. Along the way, “Kowboy Keith” (or another entertainer) leads a sing-a-long on guitar or fiddle to songs like “This Land is Your Land,” “America the Beautiful,” and, depending on the age of the kids in the group, some kiddie tunes. Kowboy Keith told stories about the people and legends of the Black Hills, which captivated — and educated — everyone in our multi-generational group. 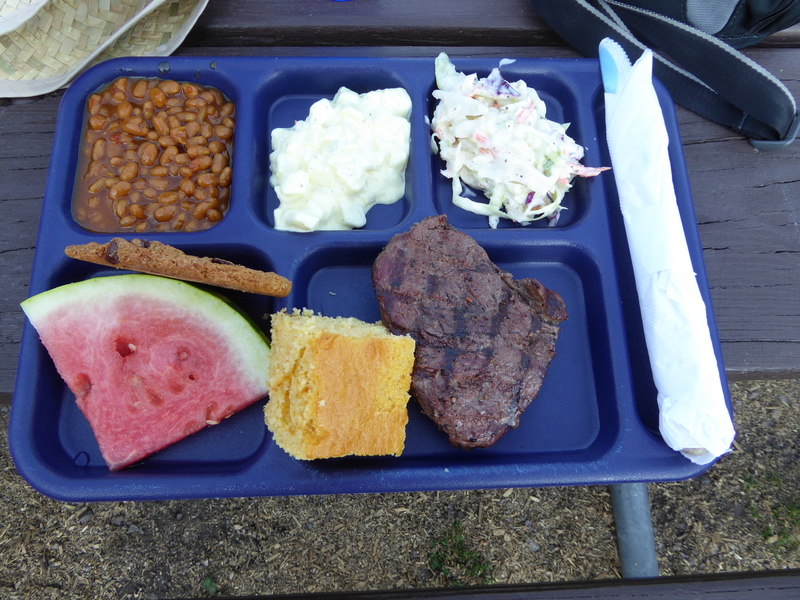 The meal itself was upscale campfire food, with a large hunk of steak or chicken, baked beans, cornbread, potato salad, coleslaw and watermelon on a plastic tray. You dine with more than 100 others (several wagons full) on picnic benches, and listen to the live musical entertainment from your tour guides. While you might not feel like doing a post-dinner Hokey Pokey, get up and join in when the group shouts through the canyon and listens for the echo. It’s one of those “That was so cool!” moments. Botticelli’s, and Firehouse Brewing Co. Downtown Rapid City is becoming micro-urban and artsy, but there are still many family-friendly restaurants here (not to mention ice cream and candy stores). The Firehouse Brewing Co., a converted 100-year-old fire station, is a good family dining spot in downtown Rapid City. We liked Firehouse Brewing Co., a converted 100-year-old fire station that’s a dark but delicious restaurant and bar. The beer bread is a specialty, but it had a stronger flavor than you would get in typical beer bread. Try the Rancher’s Pie, a pot pie-type dish with flavorful chunks of beef and a solid base of mashed potatoes, or the Firehouse Ale Soup, a deliciously thick and creamy cheese soup. Afterward, take the kids upstairs to see some of the old firehouse equipment. 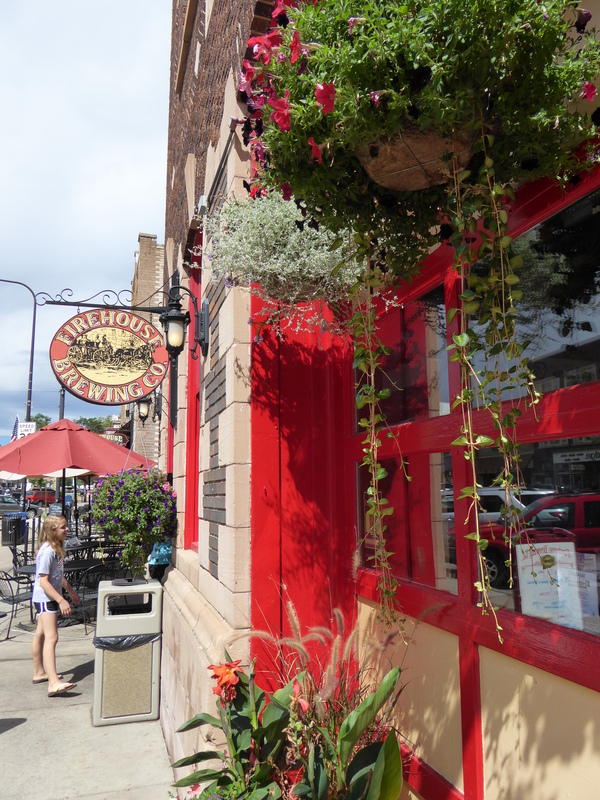 The local beer and wine are the top draws here, and they’re often served on the outdoor patio with live music. 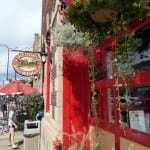 (For more on South Dakota’s wine, see this post by TravelingMom Carmel Mooney). Another solid choice is Botticelli’s. It’s obvious why this restaurant is ranked as the best Italian food in South Dakota’s Black Hills: the pasta dishes are outstanding. Just be warned that when they describe something as spicy on the menu, they mean spicy! Reservations are recommended, as the wait for a table was 90 minutes on a Friday night in summer. 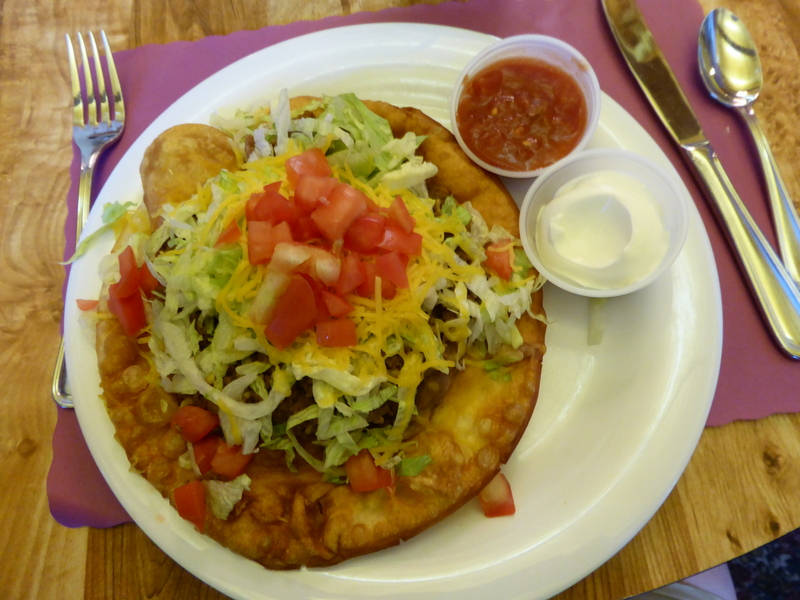 The Indian Taco, made with Indian Fry Bread, is a specialty at Laughing Water Restaurant at the Crazy Horse Memorial. Laughing Water Restaurant is an ideal dinner pick if you’re going to the Crazy Horse evening laser light show (which I also recommend). The Indian Fry Bread — something between Indian naan and a taco shell — is a unique and tasty menu item, and something the kids will like, too. 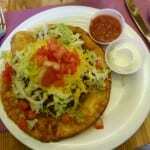 Try it with the Indian Taco, which is like a taco salad on top of Indian Fry Bread. For dessert, have “the official dessert of South Dakota,” called kuchen. It’s a creamy custard bread pie with fresh berries mixed in. 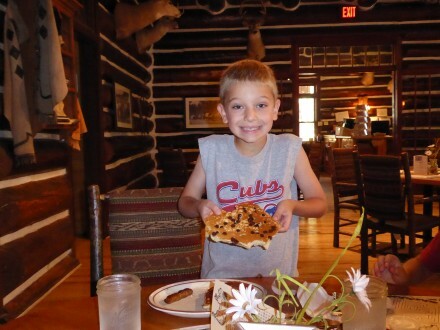 The restaurant is run by the family members of Crazy Horse Memorial sculptor, Korczak Ziolkowski. If possible, snag a seat by the huge picture window overlooking the monument for the best view. The fun atmosphere both inside and outside Saloon #10 is the big draw here. The food is pretty standard, but the 1/2 lb. Bison Elk Burger is a solid choice. With just a hint of game-y flavor, you probably wouldn’t know it was a bison if someone didn’t tell you.